This map illustrates satellite-detected areas of IDPs in the UNMISS Malakal base as seen by the WorldView-2 satellite. As of 20 February 2016, 6,438 shelters as well as 228 infrastructure and support buildings were identified. Burned areas in sectors 1, 2 and 3 were also visible. A total of 2,839 structures were burned, including 96 camp infrastructure buildings and 2,743 shelters. 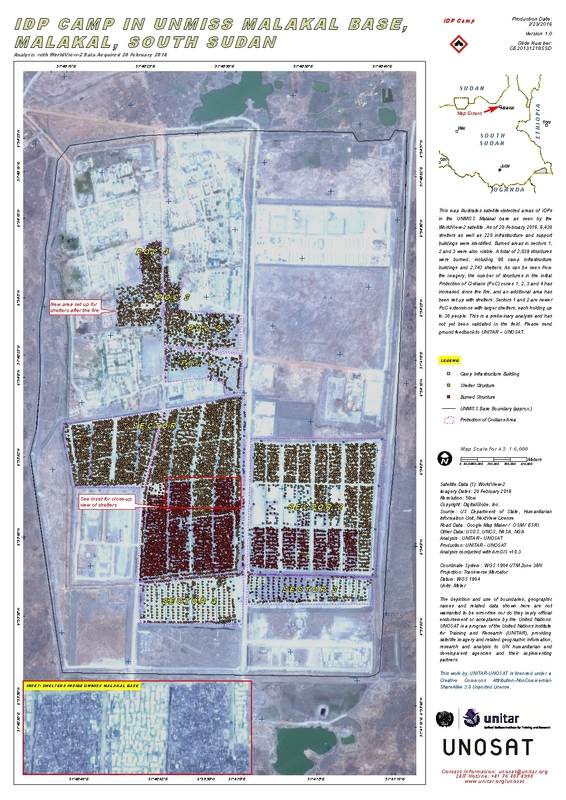 As can be seen from the imagery, the number of structures in the initial Protection of Civilians (PoC) zones 1, 2, 3 and 4 has increased since the fire, and an additional area has been set up with shelters. Sectors 1 and 2 are newer PoC extensions with larger shelters, each holding up to 30 people. This is a preliminary analysis and has not yet been validated in the field. Please send ground feedback to UNITAR-UNOSAT.